Rhubarb has been used for 3,000 years in dishes and as a medicinal remedy. Learn more about its history, biology, and health benefits. Rhubarb, the popular vegetable used in cakes, tarts, and pies, is an herb of Asian origin and has been cultivated in China for hundred of years, due to its medicinal and culinary value. Rhubarb has been traditionally used for remedying digestive complains and treating diabetes. Lowering blood sugar. Due to its hypoglycemic properties, rhubarb has been shown to be useful in the treatment of diabetes. Treating constipation and diarrhea. Rhubarb possess both astringent and laxative actions, which help regulate intestinal transit. Rhubarb also has anti-inflammatory properties and is often used in Traditional Chinese Medicine (TCM) for the treatment of fever, ulcers, headaches, and toothaches. Rhubarb stalk contains two main active constituents, anthraquinone - also found in cascara sagrada and cascara sagrada - and glycoside rhaponticin. These components are thought to be partly responsible for the anti-inflammatory and laxative actions of rhubarb. Rhubarb's laxative effect is linked to its high fiber content as well as to the compound aloe emodin. Fiber assists stool formation in the intestine, while aloe emodin stimulates the bowels and decreases pro-inflammatory cytokine production. 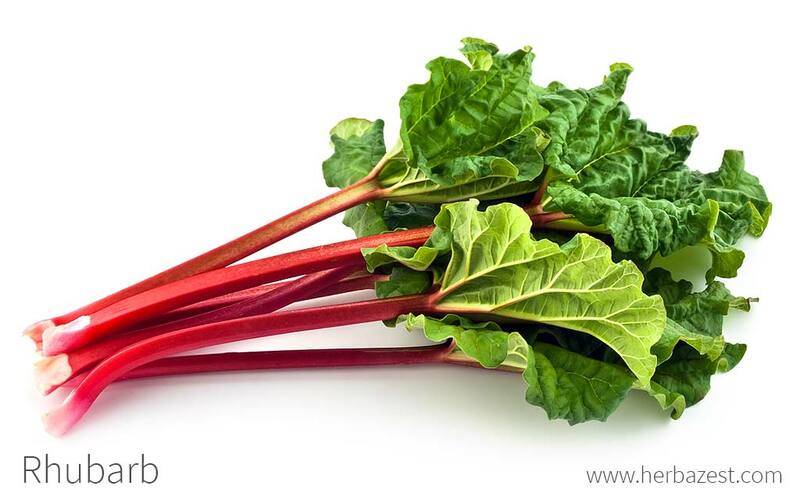 Rhaponticin, one of rhubarb's phytonutrients, can help reduce blood sugar levels and improve other markers of diabetes. In addition, rhubarb's insoluble fiber can help lower low-density lipoprotein (LDL) cholesterol levels. RHUBARB'S LAXATIVE EFFECT IS LINKED TO ITS HIGH FIBER CONTENT. Popular herbs for regulating bowel movements and relieving constipation are also psyllium and senna, while lucuma and yacon help control blood sugar levels. Rhubarb is likely safe for most people when the root is consumed as food and has been used in a number of culinary dishes. It is also possibly safe for adults taken in medicinal amounts for up to three months. Over consumption of rhubarb can aggravate existing gastrointestinal issues, such as diarrhea, upset stomach, or intestinal pain. Rhubard leaves contain oxalic acid, which is fatal in large dosages. Children should be monitored when consuming rhubarb leaves, and those who have kidney stones or other kidney diseases should either avoid rhubarb or consume it in small quantities. While more research needs to be conducted, rhubarb's high levels of oxalic acid may be unsafe for women who are pregnant or breastfeeding. People with irritable bowel syndrome (IBS) should not take rhubarb in medicinal doses, since it can irritate their sensitive gastrointestinal tract. In terms of nutrition, rhubarb is regarded as a low-calorie food, with a minimal fat and sugar content but a significant amount of complex carbohydrates and dietary fiber. Additionally, rhubarb provides large amounts of B-complex vitamins, such as B2 (riboflavin) and B9 (folate). It also possess a high concentration of vitamins A, C, and K, as well as minerals like iron, copper, calcium, and potassium. The leaves of rhubarb are toxic and cannot be consumed, but the stems or stalks are mostly used for culinary purposes. Though rhubarb is botanically classified as a vegetable, it is culinary treated mostly as a fruit, and prepared in sweet recipes, such as pies, crisps, or tarts. However, rhubarb can also add flavor to savory dishes, like stews, sauces, and chutneys. Rhubarb's root, on the other hand, is used only for medicinal purposes and taken in remedial forms, where its pharmacological properties are more concentrated. Raw. While fresh rhubarb stalks are tart and sometimes bitter, but they can be consumed in small doses as an astringent, and in larger amounts as a laxative. To be used as a mild laxative, one rootstock should be soaked in cold water for eight to ten hours before consumption. Powder. Rhubarb root powder can be mixed with water, juices, smoothies, or even morning cereal for treating both constipation and diarrhea, as well as other gastrointestinal conditions, such as ulcers. It also lowers blood sugar in people with hyperglycemia or diabetics. Liquid extract. While rhubarb stalk's extract is marketed as a flavoring agent, for culinary purposes, rhubarb root extract have only medicinal uses, and it is often consumed for treating diabetes and digestive complains. Capsules. Rhubarb root capsules, whether from turkey rhubarb (Rheum palmatum) or garden rhubarb (Rheum rhabarbarum), can be taken for short term relief of constipation and come often mixed with other laxative herbs, such as cascara sagrada, senna, aloe vera, barberry and slippery elm. When it comes to laxative supplements, it is recommended not to take them for more than eight days, as they can cause upset stomach and other forms of gastrointestinal distress. Raw rhubarb is easy to find in most grocery stores and local markets around the world, typically sold as the whole stem. Purchasing crisp, dark pink to red rhubarb is recommended, as green-stalked rhubarb can be more rubbery. Rhubarb root powder, on the other hand, can be easily found online. Rhubarb remedies, as well as supplements are mainly found in specialized health stores and online retailers. In many ways, rhubarb plants have particular needs. Unlike many plants, rhubarb thrives in cooler temperatures. In fact, it should ideally be kept in temperatures below 41°F (5°C). However, it can still survive as long as it does not have prolonged exposure to temperatures exceeding 73°F (23°C). Rhubarb is an annual plant and should be treated with care. Grow rhubarb in recently treated manure that is free draining. Make sure rhubarb has full sun available so that it can thrive. Do not harvest rhubarb plants during their first year of growth. While it can be grown from a seed, it is more common to grow rhubarb from dormant crowns planted between autumn and spring. Space plants 30-36 inches (75-90 cm) apart, with 12 inches (30 cm) between rows. Rhubarb is perennial herb with large leaves, which arise in spring time and can be either coarse and serrated, or palmately lobed depending on the species. The flowers of rhubarb are greenish-white to dark-purple and grow in branching racemes. Rhubarb is a member of the Polygonaceae family, which has approximately 1,200 species spread out over 50 genera. The genus Rheum includes about 50 species of perennial herbs, which are distributed in temperate and sub-tropical regions of the world, chiefly in Asian countries such as India, Nepal, Bhutan, China, Pakistan, Korea, Turkey, Russia, and Tibet. The name of the genus is thought to have originated from the Greek rheo, meaning "to flow", in reference to the herb laxative properties. There are four species of rhubarb with great economical importance: Chinese rhubarb (Rheum officinale), turkey rhubarb (Rheum palmatum), English rhubarb (Rheum rhaponticum), and Japanese or garden rhubarb (Rheum rhabarbarum). The characteristic that separates different types of rhubarb is the color of the edible stem, which can goes from the popular deep red to the greenish rhubarb, which has a more tart flavor. Most commercial rhubarb varieties are hybrids. The medicinal types of rhubarb belong mainly to R. officinalle and R. palmatum, while the predominantly culinary types come from R. rhaponticum and R. rhabarbarum. Rhubarb was domesticated centuries ago, with researchers believing it was first cultivated as a food crop in China approximately 3,000 years ago. It is very likely that it was used then mainly for medicinal purposes. Rhubarb was brought to Greece from the Middle East and finally reached Europe in the 14th century. The cost of importing rhubarb from Asia to Europe made it one of the most expensive vegetables of Medieval times. Rhubarb arrived on American shores in the 1800s, appearing first in Maine and Massachusetts. The economic importance of rhubarb lies within the culinary and alimentary industry. China is the world's largest producer of rhubarb, with each crown of rhubarb produced bringing in a gross revenue of $8 - $20 USD per year. Rhubarb is at an economical advantage because it is a vegetable crop that is used and marketed as a fruit, and is therefore harvestable in early summer, before the fruits have ripened. Like many herbs, rhubarb has experienced an evolution in uses. While it was originally used in ancient Chinese medicine, this vegetable is sometimes mistaken for a fruit, and used in many sweet recipes, such as strawberry rhubarb pie in the United States, but it is also consumed as spicy rhubarb in the United Kingdom. For cleaning. Rhubarb can act as a cleaner for pots and pans in order to remove stains. For insecticide. It can also make an effective insecticide. For painting. Some painters favor using rhubarb for its red pigmentation.